Delta View Timing provides the most affordable chip timing solution for races in the DFW and surrounding areas including Denton. It's perfect for smaller and first-time races uncertain of their event turnout. 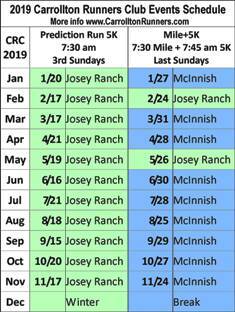 Next events: Carrollton Runners Prediction Run 5K on Sun May 19 7:30 am at Josey Ranch. Carrollton Runners Mile+5K on Sunday Apr 28 7:30 am at McInnish Park. Delta View Timing is the in-house timer for the Carrollton Runners Club since 2008. The Carrollton Runners Club hosts a Mile+5K on the last Sunday of each month. The Carrollton Runners Club hosts a Prediction 5K on the 3rd Sunday of each month. Over the years, mostly thru referrals, Delta View Timing has timed various races for churches, non-profits, schools, and other organizations. Some links and info that may be useful to visitors.